How do I renew my access to UpToDate? I got an email from UpToDate saying I need to confirm my remote access to UpToDate by logging in on the ACOM network. How do I do that? 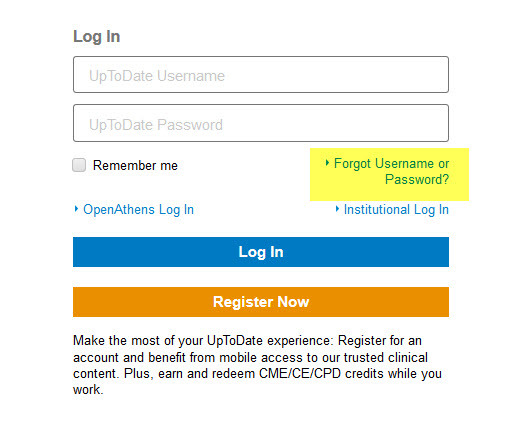 You must confirm your UpToDate account every 90 days to continue using the mobile app. The app will prompt you to log in to your account when needed or you may get an email from UpToDate alerting you that your mobile access will be terminated unless you log in to your account via the web on the ACOM network. Go to the library website at www.acom.edu/library and click on UpToDate on the left side of the page. Log in with your ACOM username and password through the red ACOM login page. (If you are are on the ACOM campus, you won't need to login with your ACOM account). Then you also have to log in to UpToDate itself with your UpToDate username and password for your personal account (this isn't your ACOM user ID and password). If you have forgotten it use the Login in Help link on the Up to Date login page (see image below). Why do I have to log on to both the Library website and the Up To Date website?